Government in action: In response to two executive orders by President Obama ordering federal agencies to review their regulations to eliminate red tape and streamline government operations, federal bureaucrats added 6.5 million paperwork hours to their workload and increased regulatory costs by $16 billion even as they wrote these reviews. The American Action Forum has found the reviews consist mostly of recycled regulations by federal agencies that have actually increased regulatory costs. “The recent ‘retrospective reports’ from the administration reveal that executive agencies have added more than $16 billion in regulatory costs, up from $14.7 billion in the previous update, and 6.5 million paperwork hours,” the report said. The agency reviews are a result of President Barack Obama’s initiative for a “government-wide review of rules on the books,” which the White House claims to have led to $28 billion in net five-year savings since 2011. However, the American Action Forum has found retrospective reviews often add additional costs to the economy. A review in 2014 added $23 billion in costs and 8.9 million paperwork burden hours. No one should be surprised by this. Asking agencies to review their regulations will instead be seen by them as a glorious opportunity to justify their existence with more work. The way to eliminate these regulations is for the elected officials in charge to, surprise!, eliminate these regulations. Don’t ask the bureaucrats to do it. Tell them to do it. And when these bureaucrats go to the press to complain and say how the elimination of this or that regulation will cause the sky to fall, the politicians have to have the courage to not back down, even when the press teams up with the bureaucrats to slander them for trying to bring the federal government under control. An investigation into the early shutdown of the first stage engine on the Atlas 5 during last week’s Cygnus launch is now centered around the rocket’s fuel system. Though they state that the system appears that it used its oxygen supply too quickly, the company has not released more details. This deal, combined with the possibility that TMT might move to India as well, suggests that India is about to move aggressively from the Third World to the First. And the reason, after decades of wallowing in poverty and failure, is that they finally abandoned in the late 1990s the Soviet models of socialism and communism and embraced private enterprise and capitalism, ideas championed by the United States. If only some modern Americans would do the same. Earth forming around sun-like star? 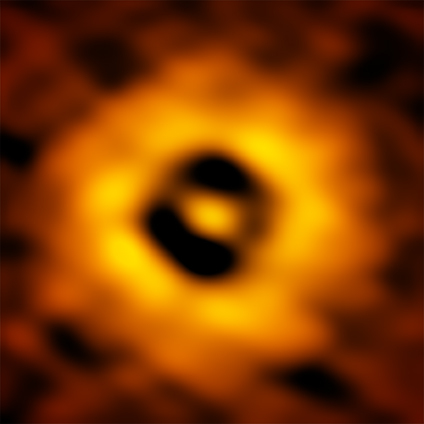 Worlds without end: The ground-based telescope ALMA has imaged a proto-planetary disk around a sun-like star that suggests an exoEarth is forming there the same distance from the star as our Earth is from our Sun. Other pronounced gap features are located 3 billion and 6 billion kilometers from the central star, similar to the distances from the Sun to Uranus and Pluto in our own Solar System. The image above right is the inner section of that disk, showing the gap at one astronomical unit, or about 100 million miles from the star, the same as the distance of the Earth from the Sun. Essentially, this relatively close star system is providing us a perfect opportunity to study the formation of a solar system not unlike our own. In the heat of competition: A state judge has denied a request by Broadcom for a temporary injunction to block the five engineers hired from that company by SpaceX from doing work during the lawsuit. The article includes further information, including details from one of the poached employees, justifying and explaining their job move. One week after the Moscow Commercial Court ordered the contractor building the new Russian spaceport Vostochny to repay $52 million in bank loans, that contractor has now filed three lawsuits totaling $17.9 million against the organization that runs the spaceport. The new lawsuits suggest that even as the contractor’s managers were embezzling millions from the spaceport, the spaceport organization was also pocketing some money that was supposed to go to the contractor. Russia: a true worker’s paradise! The competition heats up? Though he couldn’t reveal any details, the director of Russian space agency Roscosmos today said that they have found a buyer for Sea Launch. Because Sea Launch is a floating launch platform, there really is no reason the company can’t be taken over by anyone in the world. And should the buyer use the Ukrainian Zenit rocket that the platform was designed to use, the technical problems might be reduced as well. The article above begins by focusing on how the university president has backed down from his original willingness to support the squelching of free speech. I suspect this pressure from alumni, who with most universities provide a great deal of financial support, is making him rethink his positions. Another subsidized solar power company going bust? Your tax dollars at work! The U.S.’s largest solar power company, heavily subsidized by the federal government, now faces bankruptcy. News of SunEdison’s impending bankruptcy filing comes after the company’s shares fell 95 percent in the past 12 months, with shares now trading for less than $1 for the first time since the green energy company went public in 1995. SunEdison’s market value fell from $10 billion in July 2015 to around $400 million today. The news also comes after the SEC announced it was launching an investigation into SunEdison’s disclosures to shareholders regarding the company’s liquidity. SEC enforcement officials “are looking into whether SunEdison overstated its liquidity last fall when it told investors it had more than $1 billion in cash,” according to The Wall Street Journal. …The pro-labor union group Good Jobs First reported last year that SunEdison and its subsidiaries got nearly $650 million in subsidies and tax credits from the federal government since 2000. It was the 13th most heavily-subsidized company in America. This includes nearly $4.6 million in subsidies from the Department of Energy and Department of Treasury. Watchdog.org reported in October 2015 that SunEdison had gotten nearly $4.6 million from the Obama administration, including funding to build semi-conductors. A SunEdison bankruptcy could leave taxpayers on the hook for more than $2 billion. But hey, what’s a few billion here or there, if the cause is worthwhile? Even as I am appearing on Coast to Coast, John Batchelor has just posted the podcast for my appearance tonight on his show, embedded below the fold. I probably should have noted this earlier, but I am about to begin another two hour stint on Coast to Coast with George Noory. Should, as always, be a lot of fun. Fascists: Democratic attorney generals from 16 states announced today that they plan on investigating and prosecuting companies for fraud if they dare express any skepticism about global warming. The concept of dissent and debate increasingly appears completely foreign to liberal, leftwing politicians and activists. Disagree with them in any way, and they think that gives them the right to destroy you. An evening pause: Hat tip Kyle Kooy. A possible impact on Jupiter? On March 17 two different amateur astronomers have taken videos of a bright flash on Jupiter which suggests something had crashed into the gas giant. March 17th’s impact, if the evidence for it holds up, becomes the fourth such event in the past decade. The largest of these occurred July 19, 2009, and it left a distinctly dark “powder burn” in Jupiter’s upper atmosphere first spotted by Australian astro-imager Anthony Wesley. That was followed by three lesser strikes on June 3, 2010 (recorded independently by Wesley and Christopher Go); on August 10, 2010 (independently seen by Masayuki Tachikawa and Kazuo Aoki); and on September 10, 2012 (seen visually by Dan Petersen and independently recorded by George Hall). Counting the historic multiple-hit crash of Comet Shoemaker-Levy 9 in July 1994, that’s a grand total of six impacts on Jupiter in the past 22 years. The Air Force has concluded that the Japanese X-ray telescope was not hit by debris, and that its problem was thus likely caused by some internal engineering failure. What exactly happened remains unclear. Moreover, Japanese engineers still hope they may be able to save the spacecraft, as they are periodically still getting some intermittent signals from it. More chalk oppression at Emory! Push back: A conservative student group at Emory University has responded to the protests against pro-Trump chalk messages on campus by drawing more pro-Trump messages. Young Americans for Liberty also chalked other messages on campus on behalf of every other remaining Republican and Democratic presidential candidate. Some of the other chalk imagery also managed to make clever use of the other candidates’ slogans. Leaders of the limited-government-focused group said their multi-candidate campus chalking adventure is manifestly not intended to endorse any particular candidate. Instead, the goal is to buck the growing national impression that Emory is full of ninnies who are afraid of temporary, mainstream political speech that can be instantly washed away with a bucket of water and a bit of scrubbing. Good for them. They have more courage and common sense than the university’s idiot president, who had immediately agreed with the protesters that messages in favor of Trump had to be racist. Theft by government: The Obama Justice Department has resumed its partnership with state police departments to seize the property of citizens for profit. Asset forfeiture is a contentious practice that lets police seize and keep cash and property from people who are never convicted of wrongdoing — and in many cases, never charged. Studies have found that use of the practice has exploded in recent years, prompting concern that, in some cases, police are motivated more by profit and less by justice. The Justice Department’s Equitable Sharing Program allowed state and local authorities to pursue asset forfeiture under federal, rather than state law, particularly in instances where local law enforcement officers have a relationship with federal authorities as part of a joint task force. Federal forfeiture policies are more permissive than many state policies, allowing police to keep up to 80 percent of assets they seize. Participation by the Justice Department had been suspended in December, but not because the Obama administration didn’t like the program, it turns out. Instead, the suspension allowed them to keep the money themselves that local police had seized under federal law. This however discouraged local police from pursuing more confiscations, so they have resumed the program. The graph at the link is incredible. Do you know that citizens now lose more property to the government under this program than they do from ordinary burglaries? Video taken by an amateur astronomer of Hitomi shows it spinning out of control, another indication that something catastrophic occurred to the newly launched X-ray telescope. The video shows an object that looks like Hitomi, which lost contact Saturday with the Japan Aerospace Exploration Agency (JAXA), shining and then turning extremely dark in short intervals. The wild changes in brightness might mean its sunlight-reflecting side is moving turbulently. “The fact that it is rotating with extreme variations in brightness indicates that it is not controlled and that some event caused it to begin its rotation,” Paul Maley, a former NASA flight controller who observed Hitomi from the ground in Arizona, was quoted as saying. An evening pause: Something different tonight, from a cooking show that focuses on historical recipes from the American Revolutionary War era. Not only is this fascinating, it gives us a peek into life before refrigeration. Surprise! The launch control software NASA is writing from scratch for its SLS rocket is way behind schedule and way over budget. Development of this new launch control software is now projected to exceed $207 million, 77 percent above 2012 projections. The software won’t be ready until fall 2017, instead of this summer as planned, and important capabilities like automatic failure detection, are being deferred, the audit noted. The system is vital, needed to control pumps, motors, valves and other ground equipment during countdowns and launches, and to monitor data before and during liftoff. In other words, even though NASA could have simply purchased already available software that other launch companies were using successfully, the agency decided to write its own. And that decision really didn’t come before the arrival of these commercial companies, because when it was made a decade ago that was exactly the time that SpaceX was beginning to build its rocket. This is simply more proof that SLS is nothing more than a pork-laden waste of money designed not to explore space but to generate non-productive jobs in congressional districts. Fascists: A conservative Marquette University professor has been been suspended and will be fired if he does not apologize for daring to criticize the liberal actions of another professor. The story is a bit complicated, but it is worth reading. He has had a conservative blog for about a decade, and his punishment was prompted when he objected to the other teacher’s willingness to squelch conservative opinions in her classroom. He has also said he will not apologize and will sue if they try to fire him. U.S. military observations have detected debris near the Japanese X-ray telescope Hitomi that has failed to respond to communication signals. The U.S. Joint Space Operations Center on Sunday said it has spotted five objects floating near Japan’s brand new Hitomi X-ray astronomy satellite that lost communication with Earth the previous day. In a Twitter post, the center, which tracks objects in orbit, said it identified five pieces of “break up” debris in the vicinity of the satellite. None of this sounds encouraging.